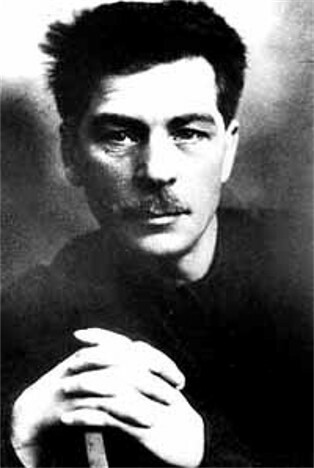 Postyshev, Pavel [Postyšev], b 18 September 1887 in Ivanovo-Voznesensk, Vladimir gubernia, Russia, d 26 February 1939 in Kuibyshev, Russia. (Photo: Pavel Postyshev.) Communist party functionary. In 1923 he was recalled from the Far Eastern Republic to oversee organizational work on the Party's Kyiv gubernia committee, and a year later he was elected secretary of the committee. By the end of 1925 he had become secretary of the Central Committee of the Communist Party (Bolshevik) of Ukraine. Then he became a member of its Politburo and Organizational Bureau (1926–30). As secretary of the Kharkiv district and city Party committees he played a leading role in the purge of Trotskyists (see Leon Trotsky) and Ukrainian national-communists (see National communism) and in the industrialization and collectivization campaigns in the Kharkiv region. From July 1930 he was secretary of the Central Committee of the All-Union Communist Party (Bolshevik) (see Communist Party of the Soviet Union) in charge of propaganda and organization. In January 1933 he was sent back to Ukraine as Joseph Stalin's personal representative, accompanied by thousands of political cadres from Russia. He was immediately elected second secretary of the CC CP(B)U and first secretary of the Kharkiv city and Kharkiv oblast Party organizations. From July 1934 to January 1937 he was in charge of the Kyiv oblast Party organization. As second secretary he was the real power in Ukraine, overshadowing Stanislav Kosior, the first secretary. During the Famine-Genocide of 1932–3 Postyshev's mission was to eliminate all opposition to collectivization and the forcible requisition of grain and to crush the Communists who defended Ukrainization and the republic's economic, political, and cultural rights. He oversaw a major Russification drive in Ukraine: the Ukrainian intelligentsia was decimated, and scores of Ukrainian cultural and educational institutions were closed. In the mass purge of the CP(B)U (1933–4) some 100,000 members were expelled from the Party, many of whom were subsequently arrested on trumped-up charges and executed. In the 1930s Postyshev became popularly known as the ‘hangman of Ukraine.’ Having acquired a taste for power Postyshev began to develop his own cult of personality and to consolidate his position in the republic by making some concessions to Ukrainian national sentiments in 1935–6. This development raised Stalin's suspicions. In 1937 Postyshev was removed from Ukraine and appointed first secretary of the Kuibyshev Oblast Party Committee. He was arrested in January 1938, executed a year later, and rehabilitated in 1956.